Nearly two weeks ago at Facebook’s f8 developers conference, the social network unveiled all kinds of exciting bits and pieces, including Timelines, the big, bold streams of content which will be taking over our personal profiles very soon. Apparently some Facebook users already have the option to try out the new Timeline feature, but if you’re not part of the lucky few, then head over to Mashable to find out how to con your way into the new look profile, pretend you’re a Facebook developer and enable it RIGHT THIS SECOND. One of the biggest differences between a Timeline and a run-of-the-mill personal profile is the cover photo at the top. During the f8 conference, Mark Zuckerberg kept saying the cover photo would provide a deeper insight into users’ personalities and kept showing us all his Timeline which had a cute photo of his dog at the top. Awh. But what if another photo of your face or a snap of your dog just doesn’t seem interesting enough for the pretty huge banner that now sits at the top of your Timeline and takes up half of the screen? Well, it’s hardly surprising that a number of services have already been launched that allow you to create a fancy cover photo and show off about your oh-so-cool life. The myFBcovers service allows you to create a big, fancy cover image using one of your own photos, giving you tools to flip it and resize it. It also lets you create a collage of lots of other images and trims them all down to the right size and shape for your cover. There are also a few pre-prepared covers too, but the first three are all dedicated to Justin Bieber, so I wasn’t really compelled to scroll through the rest. This cover service feels a little more rushed than myFBcovers and doesn’t allow users to create their own covers, it just features a selection of ready-made options. If you have a dig around you’ll probably find a few you like, but most are of a pretty low quality and make me wish I’d gone with the Bieber options above. This app from developer Face It Pages lets you include other bits and pieces of information in your cover as well as a photo, like a bio, links or a logo for people that take themselves really seriously. As you can see, all of these apps and services are pretty basic because they’ve been muddled together in the space of a week. So, we can expect to see even more pop up over the next month once more and more people get the new Timeline, which will give us all a little more choice and freedom. If you’d rather just make something yourself and you’re not afraid of a bit of cropping, then we’d suggest using an image that’s around 851 pixels wide by 315 pixels high (according to developers chatting on the Facebook help centre). But please do make sure it’s interesting, the right size (or it’ll look ‘pixelly’) AND check that it looks good in the default view too, so when you first click on someone’s profile and see the small slither at the bottom it isn’t just a dull grey blur. RUMOUR: Will Apple release a budget handset at iPhone 5 announcement? Lookscool, I never knew you could post about it, good to know thanks! You show verylatest and important things. This is very nice post! I will bookmark this blog.Let us know about myself.I am a Plummer.I worked at Al's Plumbing,Locally owned and operated company. How to Hack Your Facebook Profile Photo with Timeline …easy photoshop template to get you started on your very own personal coverpicture. How the hell is this in any way hacking? It works! Fabulous =] thanks!! You might also want to mention FacebookCovers.org. 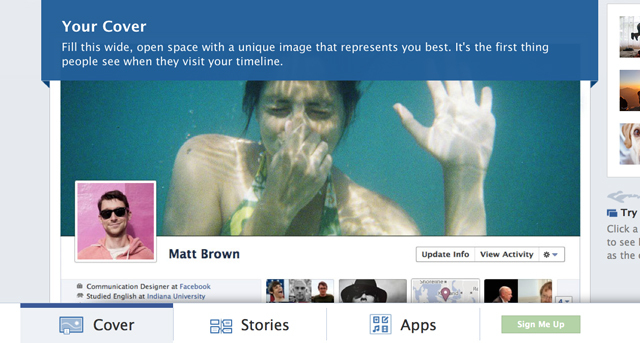 Facebook Timeline is a nice addition to the Facebook. Thanks for this post. Coverize.me banners are low-quality? I think not…also, you should give the correct pixels size to people who are making their own. That size i wrong!